These little shoes say it all. 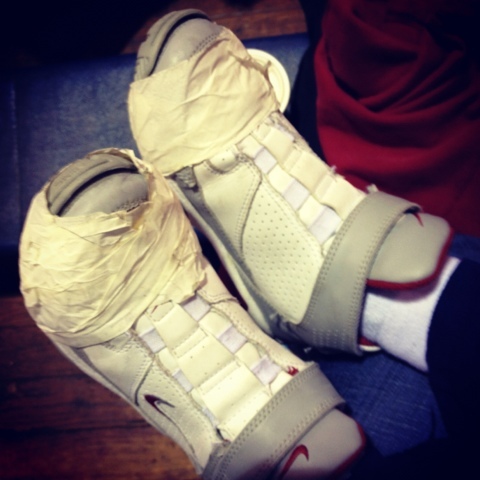 At last Saturday's game, little mr. j's soles came loose. It was hard for him to run and even after my mr. taped them up (again and again), he still ran a little awkwardly. The last few month's my souls been a little loose. My glued expectations came off. We taped me up the best we could and I think I am becoming more comfortable. little mr. j used his regular school shoes in tonight's game. They worked fine. His little team was seated 5th in their tournament and they ended up winning 3rd place. my mr. taped me up. Helped me create an impressive resume from a life where I thought not much had been accomplished. Encouraged me and has been patient. I feel like I almost have my regular shoes on again. I will be going to work tomorrow at a job perfectly suited to me and I will be back home to give hugs when school gets out, make sure the backpacks get cleaned out and put away, and take care of the dear souls I'm blessed to call family. Ok, friends, this post is something new for me. I'm typing it on a smartphone and hope all turns out alright. Please let me know if you see anything wonky. Just wanted you to know that I have not fallen off the face of the earth. Real life's just needed a lot of my attention.